tu n’es pas riche (Offenbach) /PI︠A︡TNIT︠S︡KOGO: Dorozhenka (Kozʹmina). 10” black Aprelevski Zavod ‘1939 World’s Fair’ 6300 [6300/6367], recorded 1939. DIE LUSTIGE WITWE – Vilja Lied (Lehár) (both in Russian). 10” red Aprelevski Zavod 6202/03 [0220/0219], recorded 1939. Serenata (in Russian) (Tosti). 12” vinyl Historic Masters HMB 56, POM-1911. P0838. ANASTASIA VIALTSEVA: Give me your hand, my friend, for luck (Luchich) / How beautiful your eyes (Uocchie c'arraggiunate) (Falvo). 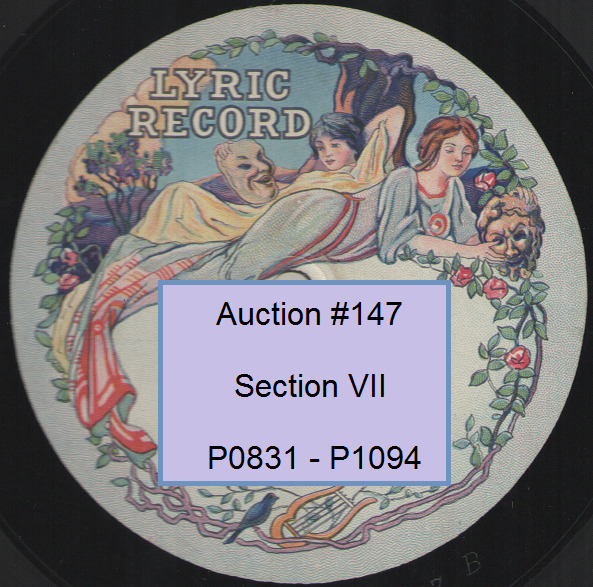 10" plum HMV EK 14 [16338/41b], POM-31 March, 1912. P0839. ANASTASIA VIALTSEVA: Do not ask (Mikhailov) / If you love me (Lincke). P0840. ANASTASIA VIALTSEVA: Ding-ding-ding (Yurev) / A little breeze (Gott). How beautiful your eyes (Falvo). 10" plum HMV EK14 [16338/41b], POM-1912. "...that sweetest and dearest of all Russian romance singers, Vialtseva....one of the busiest of artists and only after extended negotiations was she signed up to sing ten songs. When we asked her to repeat a record that was returned from the factory as defective, she demanded further payment: indeed she literally worked herself to death piling up a large fortune….Her sad and untimely demise in 1914, at the age of 40, at St.Petersburg, was marked by an overwhelming demonstration of the people's love." Talking Machine Zonophone 60030 [1440z/3001L], POM-1903/’05, resp. MARIA KARINSKAYA: You jokingly said I love you (Gypsy Romance). 10” PW plum HMV EK 48 [(6540L/1448ab)], POM-1907/’09, resp. understand my soul, so deeply sensitive) (Maria Poiret). MARIA MICHAILOWA & KLAVDIA TUGARINOVA – Evening already (Tschaikowsky). 10” black St Petersburg Amour Gram. 2-23106 [4966L/2809L], POM-1906/’05, resp. We went out into the garden (Countess Tolstaya) (both in Russian). “Yury Morfessi was a hugely popular singer whose career in Russia began a decade before the war and who had even performed for Nicholas II. I was fascinated by his beautiful appearance, his beautiful baritone voice. Morfessi - like a king, like an eagle - looked around the room. The hall froze and all attention was directed at the singer from whom poured soft music. Morfessi somehow stretched the future and began to sing softly, as if speaking to someone in the audience…. HÁRY JÁNOS – Tiszán innen, Dunán túl / Rékai Cond. : Intermezzo (Kodály). 12” plum PW Czech HMV AN 208, only form of issue, 1 Dec., 1928. A-/A, lovely copy has, Sd.1 primarily, faintest pap.rubs, inaud. P0856. IZABELLA NAGY, w. Rékai Cond. : HÁRY JÁNOS - Hogyan tudtál rózsám idejönni; Hej két tyúkom Tavalyi / Szegány vagyok, szegenyek Születtem (Kodály). In tiefen Keller sitz’ ich hier (Drinking) (Fischer) (in Russian). P0859. ANNA MEITSCHIK (C): Aufenthalt (Schubert) / XERXES – Ombra mai fu (Handel). 10” purple Bruns. 53010, only form of issue, 25 Nov., 1927. 12” black St Petersburg Monarch Gram. 022034 [96y], only form of issue, 1903. P0862. IVÁN YERSHOV: LE PROPHÈTE - Pour Berthe…Versez! que toutrespire (Pastorale & Brindisi) (1905 Version, in Russian) (Meyerbeer). 10” flush black & silver Col. 35469, announced & only form of issue, 1905. “Between 1891 and 1893 IvánYershóv performed in many student performances, but in 1894 he traveled to Milan in order to refine his technique with Cesare Rossi. By 1895 Ershóv had settled back in St. Petersburg as a member of the Imperial Opera where he performed for 34 years until 1929. During his early years at the Maryinsky Theatre in St. Petersburg he became known not only for a varied repertoire, but also for his Wagner interpretations, which brought an earthy Russian character to Wagner’s music. His renown in these roles grew to such an extent that in 1901, Cosmia Wagner invited him to Bayreuth to perform in her husband’s operas. Ershóv declined. He didn’t want to re-learn all his roles in German, and he feared he would have to ‘suppress his own interpretations of the roles in order to fit in with the Bayreuth traditions’ [Larry Lustig, The Record Collector, December, 1997]….Audiences were amazed at his ease and dexterity in the area of high C and D flat. Actually, Ershóv’s repertoire was quite vast and included some 58 roles, 30 of which were by Russian and Soviet composers….Ershóv rarely sang outside St. Petersburg and was not concerned with becoming famous. From all reports he was a rather shy, modest man….Handsome, with intense, dark eyes and a mobile face, like Chaliapin he took charge of his own makeup and costuming and was concerned about the quality of the productions surrounding him. Photos of Ershóv in character prove to be as fascinating as those of Chaliapin. P0864. LEV KLEMENTIEV: LES HUGUENOTS – Plus blanche que la blanche hermine / LEV SIBIRIAKOV & EVGENIA BRONSKAYA: Tu m'as compris, adieu! P0865. MALKA BOBKOVA: HUBICKA – Okolébavkla (Smetana), announced. 10” black Prague G & T G.C.-71390 [103z], Original 1902 Stamper. Zonophone 103027/28 [3245 / 2121g], POM-1903, missing in Bauer. P0868. EVGENIYA ZBRUYEVA: PRINCE IGOR – Now, the day! (Borodin) / KHOVANTSCHINA – In shame and disgrace (Act III) (Mussorgsky). P0870. ALMA GLUCK, w.Efrem Zimbalist (Violin): The Monotone (Cornelius). 31 Dec., 1913. Numbered Copy #22 of an extraordinarily Limited Edition. "Perhaps best of all is the aria 'Rossignols amoureux' from Rameau's HIPPOLYTE ET ARICIE, just the sort of music that the great golden age singers leave most conspicuously alone, yet requiring the assurance of technique and beauty of voice that were supposed to be theirs. Gluck's record, with its clear placing and pure flutelike ease, did something to fill a notable gap in the old catalogues." P0874. LYDIA LIPKOVSKAYA: TOSCA – Vissi d’arte. 10” Berlin Concert Gram. G.C.-2-23699 [17158b], POM-21 Dec., 1912. P0875. LYDIA LIPKOVSKAYA: SYLVIA - Pizzicato (Delibes). "Lipkowska's voice was a light lyric soprano of wide compass and if her coloratura technique hardly rivalled Nezhdanova never mind Tetrazzini, the tone was notably pure and smooth. Her records reflect her wide-ranging musical taste." P0877. LYDIA LIPKOVSKAYA: SNEGOROUTCHKA - How painful here. 12” HMV Special Shellac Pressing of Mx.2725c , POM-12 Dec., 1919. P0878. LYDIA LIPKOVSKAYA: RIGOLETTO - Caro Nome / LUCIA - Ardon gl'incensi. P0880. LYDIA LIPKOVSKAYA: IOLANTA – Why did I never know of sadness? (Tschaikowsky) / TSAR’S BRIDE – Marfa’s mad scene (Rimsky-Korsakov). P0881. SALOMEA KRUSZELNICKA: TOSCA - Vissi d'arte. [Kruszelnicka] "...was indeed an extraordinary singer, possessing a beautiful voice, extensive and of great ductility, and with an exquisite feeling, by which she attained dramatic and musical performances of rare quality, most of them unsurpassable for the style, singing line and acting ability she exhibited." HAMLET – O vin disippe la tristesse (both in Polish). 12” dark green Warsaw Zonophone Z-062003/04 [191/92af], POM-28 Aug., 1911. P0883. MIKHAIL VAVICH: FAUST – Invocation à la nuit / Le veau d´or (in Russian). 10” black St Petersburg Favorite 1-75082/87 [6419/6424-O], POM-1910. P0884. ANDREII IVANOV, w. Walter (Pf. ): Four Dargomyzhsky Songs, 2s. 7¾ ” red CCCP Aprelevski Zavod 00008/09, recorded 1951. KHOVANSHCHINA - All is Quiet in the Camp (Mussorgsky), 2s. P0886. ANDREII IVANOV, w. Nebolsin Cond. : PIQUE DAME – It chanced at Versailles (Tschaikowsky), 2s. 10” black CCCP Aprelevski Zavod 15209/10, recorded 1947. PIQUE DAME – Everyone knows love on earth (Tschaikowsky), 2s. 10” pale blue CCCP Aprelevski Zavod 13347/48, recorded 1946. P0888. ANDREII IVANOV, w. Dunajevsky Cond. : THE THREE COMRADES - Kakhovka's song (Dunajevsky) / Partisan Zhelezniak (Blanter). 10” red USSR Aprelevski Zavod 14401/37, recorded 1947. P0890. OLIMPIA BORONAT: Senza l’amore (Tosti). P0892. OLIMPIA BORONAT: RIGOLETTO – Caro nome. 10” red St Petersburg G & T G.C. -53348 [1772L], Stamper II, POM-1904. (in Italian). 10” red St Petersburg G & T G.C. -53353 [1777L], POM-1904. A-B, very decent copy has lt.scuff & rubs, inaud., except for 2 wee ticks. P0894. OLIMPIA BORONAT: I PURITANI – Qui la voce (1904 Version). 10” red St Petersburg G & T G.C. -53351 [1775L], POM-1904. A-, beautiful copy has faintest rubs & minuscule scr, inaud., minor label scuff. MIREILLE – O légère hirondelle. 10” PW silver Victor IRCC 50, POM-1904. LES PÊCHEURS DE PERLES – Comme autrefois (both in Italian). (1904 Version, in Italian) /ANTONINA NEZHDANOVA: Die Nachtigall (Alabieff). (1908 Version, in Italian) / LES HUGUENOTS – Ô beau pays. P0901. OLIMPIA BORONAT: ZABAVA PUTYATISHNA  Guai! No no! (Ivanov). 10” red St Petersburg G & T G.C. -53350 (1774L), Stamper II, POM-1904. P0902. OLIMPIA BORONAT: ZABAVA PUTYATISHNA – Guai! No no! (Ivanov). P0904. ANTONINA NEZHDANOVA: Ave Maria (Bach-Gounod). 10” red St Petersburg Amour Gram. G.C.-2-23319 [7221L], POM-1908. LES HUGUENOTS – Nobles seigneurs (Meyerbeer) (both in Russian). It is not the wind (Rimsky-Korsakov) / MASQUERADE - Nina’s romance (Glazounov). 10” red Aprelevski Zavod 8961/60, POM-4 May, 1939. P0911. ANTONINA NEZHDANOVA: LES HUGUENOTS – O beau pays de la Touraine (in Russian). 10” red Moscow Pre-Dog G.C.-2-23317 [7219L], POM-1908. A-, lovely copy has light rubs & occasional light scrs, very minimally audible. P0912. ANTONINA NEZHDANOVA:DEMON – The Night was warm (Rubinstein). 12” S/S HMV Special shellac Pressing of Mx. 398ac, POM-9 May, 1911. P0914. ANTONINA NEZHDANOVA: WINTERMÄRCHEN - Schumücket euch mit Rosen (Goldmark) / ZAUBERFÕTE - Der Hölle Rache (both in Russian). "Neshdánova was a lyrical and coloratura soprano of great purity, and her many records are invariably well made.... Undoubtedly the pick of...specimens of Neshdánova's art is the rare aria from Goldmark's Shakespearian Opera....Her long-drawn-out, unconventional cadenza is a beautiful piece of workmanship." P0915. ANTONINA NEZHDANOVA: SNEGOROUTCHKA – To go gathering berries / LEV SIBIRIAKOV: RUSALKA – Well, what do I see! (Dargomyzhsky). Ah, destiny (Glinka). 10” S/S HMV Special shellac Pressing of Mx. 2710r, POM-1907. P0919. ANTONINA NEZHDANOVA: A LIFE FOR THE CZAR - I do not grieve (Glinka). 10” S/S HMV Special shellac Pressing of Mx. 2718r, POM-1907. “I listened attentively [to Sibiriakov] and what did I hear? An enormous wave of soft sound which was phenomenally powerful, where the top and the bottom notes sounded equally rich and strong and the middle was wonderfully firm – a voice in which the forte and piano were equally full and supported unshakably firmly on a column of air, marvellously supported on the breath. BORIS GODUNOV- Duet – Marina & Rangoni (Mussorgsky). 12” S/S HMV Special shellac Pressing of Mx. 2905c, POM-12 Nov., 1913. “[Bragin's] "...records indicate that in his youth, at any rate, his accomplishments were representative of the high standards extant in Imperial Russia. The voice seems to have been a good-sized high baritone....A much-abbreviated rendering of Tonio's [PAGLIACCI] Prologo (in Russian) [above] reveals a wider range of dynamics and the big melody is carried in an attractive and well-focused tone." 175th Anniversary) redAprelevski Zavod 16453/54, POM-1948. FAUST – Il se fait tard (Garden Scene) (in Russian) (Gounod), 2s. ELENA KATULSKAYA: Duettino, Levko & Pannochka (Rimsky-Korsakov). (Rimsky-Korsakov). 12” vinyl Historic Masters HMB 98, POM-1911/'12, resp. P0936. A. A. DERSCHAWIN (B): LES HUGUENOTS - Seigneur, rempart et seul soutien / I. C. VASLINSKY (T): TOSCA – E lucevan le stelle (both in Russian). P0937. Y. S. GALSKY (T): Si vous l’aviez compris / Torna (both Denza; in Russian). 10” dark green Zonophone X-2-62943/44 [16195/96b], POM-1911. PIQUE DAME - ‘Twill soon be midnight. (Tchaikovsky). 10” black Moscow Gram.Concert G.C. 2-23313 [71200L], POM-1908. P0940. NATALIA ERMOLENKO-YUZHINA: ROGNEDA - The blue sea moaned (Serov). 10” black Moscow Gram.Concert G.C. 2-23310 [7191L], POM-1908. NORMA – Casta Diva / Ah! bello a me ritorna (in Russian). YUZHINA & DAVID YUZHIN: AÏDA - Fuggiam gli ardori (in Russian). P0943. NATALIA ERMOLENKO-YUZHINA: MADAMA BUTTERFLY – Un bel dì / DER FLIEGENDE HOLLÄNDER – Senta’s ballad (both in Russsian). P0944. NATALIA ERMOLENKO-YUZHINA: TANNHÄUSER - Allmächt’ge Jungfrau (in Russian) (Wagner) / PRINCE IGOR - How dreary is everything [Yaroslavna’s Aria] (Borodin). 10” black Angel Moscow Gram.Concert G.C. 2-23475 / 2-23486 [7057r / 14200b], POM-1909/’10, resp. "The recordings of Natalya Yermolenko-Yuzhina are a revelation. Yuzhina was born in Kiev in 1881 and studied with Maria Zotova in both Kiev and St. Petersburg. She later worked with Paul Vidal in Paris. Her operatic début in 1900 as Lisa in PIQUE DAME in Kiev was swiftly followed by a 1901 début in St Petersburg that lead to a contract with the Mariinsky Theatre. Yuzhina sang with the Mariinsky from 1901 to 1905, continuing guest appearances at the Bolshoi. A 1903 GÖTTERDÄMMERUNG paired Yuzhina’s Gutrune with Litvinne’s Brünnhilde. In 1904 she sang Brünnhilde in the Bolshoi’s RING Cycle. She joined the Bolshoi afterwards, remaining until 1908. Important appearances at La Scala during the 1906-1907 season, and as Marina in the 1908 Paris première of BORIS GODUNOV with the Diaghilev Company and Chaliapin in the title role, added to Yuzhina’s renown; she was awarded the Légion d’Honneur. From 1910 to 1915 Yuzhina was the leading dramatic soprano at the Bolshoi singing the Russian première in 1913 of Richard Strauss’ ELEKTRA. From 1915 to 1920 she was once again at the Mariinsky, having great success in 1915 with Chaliapin in PRINCE IGOR and MEFISTOFELE in 1918. Yuzhina immigrated to Paris in 1924 and joined the Russian community there, occasionally concertizing. In December 1930 she sang Natasha in Dargomyzhsky’s RUSSALKA with Dimitri Smirnoff and Chaliapin at the Théâtre des Champs-Élysées. Yuzhina would have only been 49, but this was probably her last stage performance. Although large voices often gave early recording devices a difficult time, Yuzhina’s records are thrilling. It clearly was a superb natural voice, with a solid, rich timbre throughout her range. Her voice has no weak patches and her range seems endless." P0945. VLADIMIR KASTORSKY: Autumn / Travelling Song (both Glinka). P0946. VALDIMIR KASTORSKY: PRINCE IGOR - No sleep, nor rest (Borodin) / RUSLAN AND LUDMILLA - The happy day is gone (Glinka). Die Beiden Grenadiere (Schumann) (both in Russian). (in Russian) / IVAN SUSANIN – They guess the truth (Glinka). They guess the truth (Glinka) / PIQUE DAME – It chanced at Versailles. “Vladimir Kastórsky was one of a number of outstanding singers associated with the Imperial Russian Opera in St. Petersburg, and, like so many other Russian artists active at that time his records have always fascinated the collector. Possessing an exceptional voice he was one of an important quartet of basses - the others being Feodor Chaliapin, Lev Sibiryakov, and Konstantin Serebriakov. What they had in common was the ability to sing the demanding roles requiring gravitas that has for the most part dominated the Russian operatic scene….Had Kastórsky performed outside Russia Kastórsky himself might well have become even more universally acclaimed than his great colleagues and rivals Chaliapin and Sibiryakov, for it is reported that in certain roles he surpassed them both. On 19 May 1908 at the age of only 37 it was Kastórsky, as a member of the Moscow Imperial Opera Company, who created the role of Pimen in BORIS GODUNOV at the sensational first performance in Paris. It was an all star cast that included Chaliapin as the Tsar. Dimitri Smirnov sang the false Dimitri, the Marina was Natalie Yermolenko, Ivan Alchevsky sang Shuisky, Vasili Sharanov was Varlaam and Mitrofan Chuprinikov sang the Innocent. Throughout his professional career Kastórsky would always be so fortunate and talented to appear with singers of international repute, particularly at the Mariinsky. Your tresses shine like honey-hued dew (Rimsky-Korsakov). LEV SIBIRIAKOV: LAKMÉ – Lakmé ton doux regard (both in Russian). P0953. NIKOLAI SHEVELEV (Bar. ): KHOVANSCHINA – All is quiet in the camp (Mussorgsky) / EUGEN ONÉGIN – Written Words (Tschaikowsky). Epithalamium (Rubinstein). 10” black Angel St Petersburg Monarch Gram. (arr. M. Slonov). 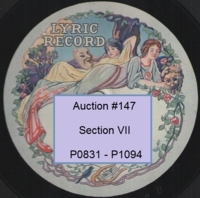 10” dark blue Gramplasttrest 123 [5252/5261], recorded 1937. P0956. NIKANDER KHANAEV:PIQUE DAME – I do not know her name / What is life? 10” red & gold Muz-Trust 1577/78, only form of issue, 1930. (both in Italian). 10” Eng. Vocalion Broadcast Twelve 5017, only form of issue, 1928. P0958. GERSHON SIROTA: Habein Yaker Li Ephraim / V'sayorev Alecho. 10” pink Warsaw Favorite 1-75600/1-75611 [4093/4104-o], POM-1908. Give happiness to my dear friend's hand / Gypsy romance. 10” dark green St. Petersburg Zonophone X-3-62056/63 [6797/6912r], POM-1909. P0962. ALEXANDER MIKHAILOVICH DAVIDOV: CAVALLERIA RUSTICANA – Siciliana (in Russian) (Mascagni) / DUBROVSKY - O give me oblivion (Napravnik). 10” black St. Petersburg Favorite 1-75122 [6559-o], POM-1910. A Pair of Bay Horses (Donaurov) / I will not tell you (Sung by the Composer). I shall not forget that dark night (Artemev) / You jested (von Ritter). HALKA – The wind wails in the hills (Moniuszko). P0967. LEONID SOBINOV: MEFISTOFELE – Giunto sul passo (in Italian). 12” red St Petersburg Gram.Monarch 052293 [2058c], POM-30 Oct., 1911. P0968. LEONID SOBINOV: RUSALKA – Unwillingly to these sad shores (Dargomyzhsky). 10” red Moscow Gram.Concert G.C. 2-22654 [1969L], POM-1904. SNEGOROUTCHKA - The joyous day departs (both Rimsky-Korsakov). 12” PW Historic Catalogue #2 HMV DB 890, POM-1910/’11, resp. 12” dark blue Connoisseurs' Record Club HMV ABHB 7, POM-1910/’11, resp. MANON – Le Rêve (in Russian). 12 white Archive HMV VB 19, POM-1910. P0978. LEONID SOBINOV: LOHENGRIN – Mein lieber Schwan (in Russian). 12” pink Moscow Gram.Concert 022137 [1979c], POM-5 Feb.,1910. “Sóbinov was a celebrity almost from the very start and the gentle, caressing timbre of his voice, his vocal charm, his wonderful enunciation and his elegant stage-presence, along with a highly developed intellect, rare in an opera singer, all combined to make him a first-class exponent of a wide repertoire which included Lensky, the Prince in RUSALKA, Nadir, Alfredo and Lohengrin. Sóbinov rightly said about himself: ‘My artistic individuality is more inclined to the elegiac than to brio’." LES PÊCHEURS DE PERLES – Je crois entendre (both in Russian). LES HUGUENOTS - Plus blanche que la blanch ermine (both in Russian). P0985. DMITRI SMIRNOV: TOSCA - E lucevan le stelle (in Italian). 12” pink Moscow Gram.Monarch 052269 [429½s], POM-1909. META SEINEMEYER & CARL MARTIN OEHMAN: O dolci mani (in German), 3s. (in Russian) / MANON - Le rêve (in Italian). P0988. DMITRI SMIRNOV: RUSLAN AND LUDMILA – There is a desert country (Glinka) / RUSALKA – Unwillingly to these sad shores (Dargomyzhsky). O Tsarevitch, I implore thee (both Mussorgsky). P0992. S. A. BATURINA: DUBROVSKY – Masha’s romance (Nápravnik). P0993. S. A. BATURINA: PIQUE DAME – ‘Twill soon be midnight. P0994. NIKOLAY ABRAMOVICH BOLSHAKOV (T): The North Star (Glinka) / ALEXANDER M. KARENZIN: (T) The sweet scent of lilac (Plotnikov). 10" plum HMV EK 43 [4822/6592L], POM-1906/’07, resp. (Pablo de Sarasate) / Journey from Mieres (Steinberg). (both Dargomyzhsky); My genius, my angel, my friend (Tchaikovsky). P0998. MARIA MAKSAKOVA: Songs by Borodin / Varlamov. MARIA MAKSAKOVA & XENIA DERZHINSKAYA: Already shades of night. “Maria Maksakova was an ultimately Russian singer. The Bolshoi’s lead singers loved partnering with Maksakova on stage because she had that rare ability to feel her partner and latch onto his state of mind. In 1919 she made her début as Olga in EVGENY ONÉGIN. In the autumn the baritone Max Maksakov arrived at the theater as a new director (and soloist) and gave her several new roles. The two became close, he proposed, and in 1920 they married, forming a sparkling duet on stage. In 1923 Maria Maksakova came to Moscow, débuted (as Amneris) substituting Obukhova, who fell ill, and was instantly invited to join the ensemble. In 1925 Maksakova moved to Leningrad's Mariinsky Theatre, but in 1927 she returned to Bolshoi where she continued to work as a leading soloist until her retirement 1953. Maksakova was one of the first Soviet artists who were allowed in the mid-1930s to perform abroad. Monarch Gram.Concert 2-23538/12 [14823b/14890b], POM-1910. P1003. MARIA MICHAILOWA: LUCIA – Al fin son tua (in Russian). 10” black Angel St Petersburg G & T 23448 [2867L], POM-1905. P1008. MARIA MICHAILOWA: NOZZE - Deh vieni, non tardar (in Russian). 10” flush black St Petersburg G & T 23144 [462x], Original 1901 Stamper. C-D, a very used copy replete with heavy rubs & lt.scrs, only occasionally audible. doux berger (in Russian). 10” black St Petersburg G & T 24377 [2810L], POM-1905. “Maria Michailowa made her début at the Mariinsky Theater in 1892 and was a featured performer with that company for more than two decades. In the early years of the 1900s, she toured Russia extensively and performed in Japan in 1907. Michailowa had a fear of traveling over water [thus limiting] her ability to appear outside continental Europe. Oscar Hammerstein was so taken with her voice that he attempted to engage Michailowa for his Manhattan Opera Company, but she would not travel to New York. P1013. I .N. BOBROV (Bar): Swift as the waves all the days of our life / Dubinushka. 10” dark green St. Petersburg Zonophone X-62795/96 [7510/11L], POM-1908. If only I had known / Silence descends on the golden cornfields (both Tschaikowsky). P1016. ODA SLOBODSKAYA: w.Ivor Newton (Pf. ): Lullaby to an angel (Lermontov). Roses (Rubinstein) / SOROTCHINSKY FAIR - Parassia's Reverie (Mussorgsky). "[Slobodskaya] has a never-failing power to convey the precise significance of each song she sings to audiences ignorant of the Russian language. And it is with a Russian richness of temperament that she enjoys or suffers everything she sings....Working with her was always an adventure...."
Dmitri! Tsarevitch! (Fountain duet) (Mussorgsky). N. S. LUKIN: Song of the Venetian Guest (Rimsky-Korsakov). POM-18 Dec., 1929 / 29 Sept., 1930, [BE 1892-1/93-1], (Unpublished ‘Takes’). NAUGHTY MARIETTA – Ah, sweet mystery of life (Victor Herbert; in Swedish). P1031. JUSSI BJÖRLING, w.Hanns Bingang Cond: THE DESERT SONG – Aria (Romberg) / DAS VEILCHEN VON MONTMARTRE – Aria (Kálmán) (both in Swedish). P1032. JUSSI BJÖRLING, w.Grevillius Cond: Ninon (Kaper) / Gitarren klinger (Gyldmark). 10” plum HMV X.4179, only form of issue, 10 Oct., 1933. O milda sång (Törnquist). 10” plum HMV X.3829, only form of issue, 18 Sept., 1931. Dein ist mein ganzes Herz / Von Apfelblüten einen Kranz (both Lehár; in Swedish). P1039. JUSSI BJÖRLING, w.Grevillius Cond: FANAL - I Männer över lag och rätt (Atterberg) / LA FANCIULLA DEL WEST - Ch'ella mi creda libero (in Swedish). P1041. JUSSI BJÖRLING, w.Grevillius Cond: Ochi Chernye (as ‘Svarta ogon’) / Tangoflickan (K.O.W.A., pseudonym of Almroth). (both in Swedish). P1043. JUSSI BJÖRLING, w.Grevillius Cond: Klovnens tango (Handberg-Jørgensen) / Min längtan är du (Bode). 10” plum HMV X.4176, only form of issue, 13 Sept., 1933. (‘Take’ 2 [of two issued ‘takes’]) (Armand Thiel). P1048. JUSSI BJÖRLING, w.Grevillius Cond: RIGOLETTO - La donna è mobile / PAGLIACCI - Vesti la giubba (1933 Versions, both in Swedish). / CAVALLERIA RUSTICANA - Siciliana (1934 Versions, both in Swedish). P1051. JUSSI BJÖRLING, w.Sune Waldimir (Engström) Cond: Bryllupsvalsen (Christgau) / Lilla prinsessa (Enders). 10” plum ‘Art Label’ (featuring photos, both sides, of the King & Queen of Sweden) HMV X.4449, only form of issue, 1 May, 1935. (Enrico Caruso; in Swedish) / Sjung din hela Längtan (Widestedt). SADKO – Song of the Indian guest (Rimsky-Korsakov) (both in Swedish). DER BETTELSTUDENT – Ich hab' kein Geld (Millöcker) (both in Swedish). "...when Jussi Björling's famous recording of Paris' entrance song is permanently set in your ears, any other tenor is bound to sound strained." DER ZIGEUNERBARON - Wer uns getraut? (Johann Strauss) (both in Swedish). (Prince Gustaf) / Nämner du Sverige (Wide [Widestedt]). (Prince Gustaf) / Hye-Knudsen Cond. Studenter-Sangforeningen [not with Björling]: Hellige Flamme (Weyse). 10” plum Scandinivian HMV X.7255, POM-28 April, 1938. P1062. JUSSI BJÖRLING, w.Harry Ebert (Pf. ): Morgen / Cäcilie (both Strauss). P1063. JUSSI BJÖRLING, w.Harry Ebert (Pf. ): Adelaide (Beethoven), 2s. - David M. Jackson [in] Alan Blyth’s SONG ON RECORD, Vol. II, p.175. A spirit flower (Campbell-Tipton) / Sylvia (Speaks). P1072. JUSSI BJÖRLING, w.Frederick Schauwecker (Pf. ): Ständchen / Die Forelle (both Schubert). 12” Scandinavian HMV DB 21593, POM-11 April, 1952, New York. P1073. JUSSI BJÖRLING, w.Harry Ebert (Pf. ): Die böse Farbe (Schubert). P1074. JUSSI BJÖRLING, w.Harry Ebert (Pf. ): Frühlingsglaube (Schubert). P1075. JUSSI BJÖRLING, w.Harry Ebert (Pf. ): Wandrers Nachtlied (Schubert). P1076. JUSSI BJÖRLING, w.Harry Ebert (Pf. ): Ich möchte schweben (Sjögren). CARMEN – La fleur que tu m’avais jetée / MANON – En fermant les yeux (Le rêve). P1082. JUSSI BJÖRLING, w.Cellini Cond. : LA BOHEME – Che gelida manina / PAGLIACCI – Vesti le giubba. 12” HMV DB 21602, POM-13 Jan., 1951, New York. LA BOHEME - O soave fanciulla / RIGOLETTO - E il sol dell'anima. TOSCA – E lucevan le stelle / FANCIULLA – Ch’ella mi creda libero. P1086. JUSSI BJÖRLING, w.Grevillius Cond. : RIGOLETTO – Questa o quella / TURANDOT – Nessun dorma! 10” V 10-1200, POM-March, 1944. A-, very decent copy has lt.rubs; Sd.2 has grey on peaks. FORZA - Solenne in quest'ora / LA BOHEME - O Mimi, tu più non torni. OTELLO - Sì, pel ciel / LES PÊCHEURS DE PERLES - Au fond du temple saint. w.pristine label, only form of issue, 15 June, 1916 [subsequent issues are dubbings]. (both sung by Composer). 10” flush black Eng.Col.E 3750 [55852/53], w.pristine label, only form of issue, 15 June, 1916, [subsequent issues are dubbings]. (sung by Composer). 2s. 10” blue V 45204, POM-15 Oct., 1920. P1092. JOSEF ROSENBLATT: Umipnu chatuenu (sung by Composer). 2s. 10” blue V 45242, POM-4 Nov., 1920 / 31 Jan., 1921. POM-9 May, 1924. [Elusive disk, from very end of Acoustic Era]. Machtenberg Male Choir: Arashas s’fosenu (Rapaport). 10” red Orth Vla 4034, POM-7 / 6 Sept., 1927.